As with clocks: when you have more than one torque wrench, you don’t know what torque it is. The black driver had a solder blob in its adjustment socket, obviously intended to prevent unqualified people (that would be me) from bungling a production-critical calibration. 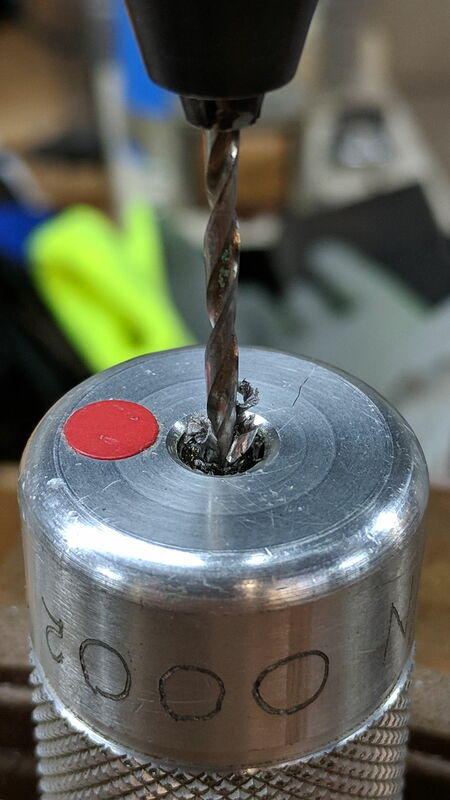 Turning a tap into the hole produced enough traction to yank the solder shell straight out of the hex. Whew! The red driver goes to 30 lb·in, the silver to 30 lb·in, and the black to 100 oz·in. The red and black now agree to within maybe 4 oz·in, which I think is Good Enough, and both within 4 lb·ft of my Harbor Freight 200 lb·ft clicky wrench, which probably doesn’t mean much at the low end of the wrench’s scale. The silver driver refuses to agree with anything, which suggests somebody else monkeyed with its calibration before I laid hands on it. This entry was posted on 2018-05-04, 07:52 and is filed under Machine Shop. You can follow any responses to this entry through RSS 2.0. Both comments and pings are currently closed. You can make a reasonably accurate torque standard with a ruler and a weight. Aye! At some point, I must conjure a pulley, maybe a foot in radius, with dangling weights. It may not be laboratory grade, but it’ll be better than nothing! I have an ounce-inch torque screwdriver and I take childish delight in it. Cranked all the way down, it makes a perfect handle for a driver bit that also needs to be mounted when my customary and usual handle is already in use. 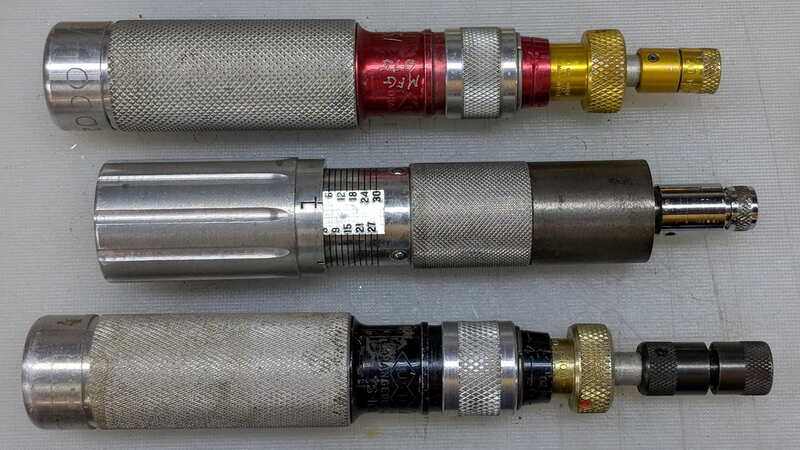 I prefer real screwdrivers but there are too many fastener styles and not enough garage sales… Mine is similar to your red and yellow one. Who would need one? Someone using nylon nuts and machine screws for light weight or high insulation resistance… Laptop computers if one is ham-handed. Mostly, I tighten screws “about right”, working under the principle that if you never twist off a head, you’re not making ’em tight enough.